We all love a good cake, muffin or a cookie (or a hundred), and anyone who’s into baking would need a reliable baking set to start off with. It’s quite frustrating to start cooking anything for that matter if you don’t have the necessary equipment. When it comes to baking, this is even more important, because there are many contraptions for different kinds of baking purposes, be it cookies, brownies, cakes or muffins. Plus, it also helps your baking look and taste equally good. Specific moulds, icing tubes, and other knick-knacks help you add that extra baking pizzazz to make you a chef in your own right. Traveling with a glass food container is tricky and spilling your foodstuffs out of it is by far the easiest thing possible. 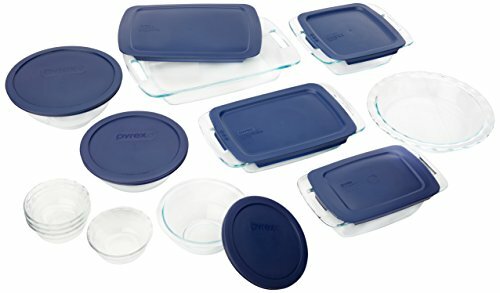 But thanks to Pyrex, their Easy Grab 19-Piece Glass Bakeware Set solves both of these problems like a cakewalk. More precisely, its BPA free, microwave and oven safe blue lid is reliable and makes transportation a breeze. For ease of gripping, you’ll find ergonomically constructed large handles. And once you’re done with your meal, cleaning the set is nothing to be afraid of. Unlike other brands, it doesn’t come with hard to reach corners. Alternately, it has got soft contours, that you can wash without any hassle. Needless to say, your dishwasher (top rack) will take care of the lids. Another great thing about this nonporous glass unit is that it won’t keep on holding the food flavor, odor or strain after you empty it – a feature that makes this unit ideal for storing your leftovers on fridge and freezer. 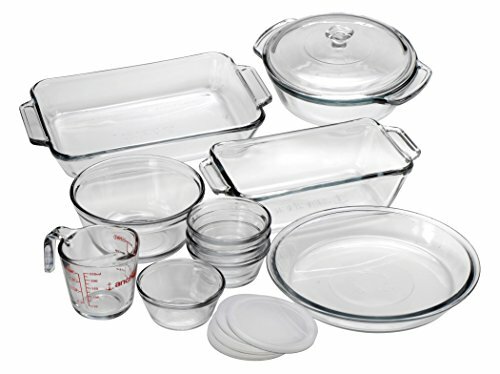 A word to the wise – don’t use larger glass pans if you have a comparatively narrower oven in your kitchen. It is such a rarity to find a bakeware set that is both versatile and nonstick, but this brainchild of Calphalon owns these things with ingenuity. Its interlocking nonstick layers are highly efficient in perfectly releasing the food items without any residue. Every time! Still, it’s a good idea to use some butter or oil, especially if you don’t want to take chance with your dining presentation. As a different approach, a parchment paper or a baking mat will also work fine here. 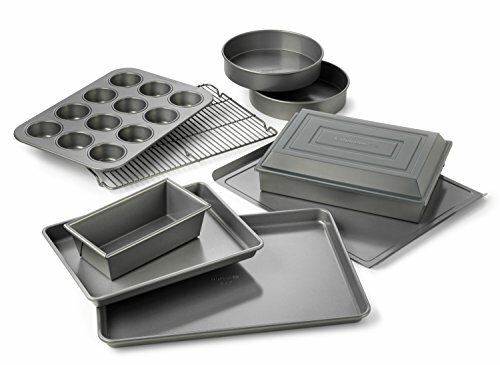 Full of modern charm, this 10 pc grey bakeware set includes one large cookie sheet, one baking sheet, two 9″ round cake pan, a 9″ x 13″ cake pan, a 9″ x 13″ brownie pan with lid, a medium loaf pan, 12 cup muffin pan, and a cooling rack. So many things, yet Calphalon maintains the quality of their creation. Therefore, you can prepare your evening snack on the muffin trays or cookie pans without the least chance of getting the foods burnt or stuck in. Apart from providing you with a well cooked banana bread, or cupcakes, this hefty set also helps you reheat your meal in the oven. Interestingly, many users prefer the included cooling rack (that can endure up to 500 degrees) for reheating purpose. The USA Pan is putting a lot of emphasis on the supplementary appliances they are included with this bakeware set, but frankly speaking, a lot of brands are also doing the same. However, we are impressed by another corner of this brand – the Aluminized Steel Construction! It verily makes the tools incredibly robust, and hence, commercial grade. The surface is designed to be much more productive with its PTFE and PFOA free patented nonstick coating. Thankfully, it can also circulate air for baking your Swiss rolls or pizzas evenly. Warp resistant, this top shelf bakeware is meant to withstand high temperature (up to 450 degree Fahrenheit). In addition, the Americoat plus silicone nonstick plating is unmatched in keeping the unit rust free. It neither peels off nor lets the foods stuck or burnt. To deal with the cleaning issue, it’s better to rinse it off manually with a paper towel or soapy water and then allow it to dry by itself. This practice will increase its longevity. Last but not the least, it’s backed by a limited lifetime warranty. 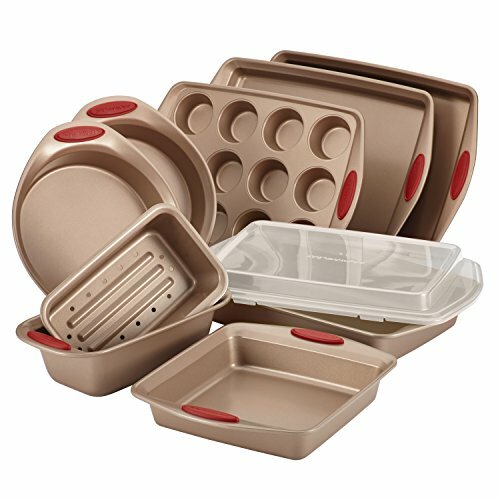 The Rachael Ray Cucina 10 Piece Bakeware Set is latte brown in color, and its cranberry red handle grips simply help it stand out. We feel like such play with colors is something that’s been missing from the bakeware industry forever. No doubt, lots of chefs will actually buy the set merely because of this aesthetic feature. However, Rachael Ray justifies their product’s beauty by assigning bunches of functional traits in it. Firstly, the unit has got hefty carbon steel construction, graced with rolled-rim edges so to give you a comfortable grip even when you’re in a hurry! Second, its nonstick properties are induced on both inner and outer sides of the pans. As a result, you’ll never face any cleaning issue with it. And since it’s recommended for hand wash only, this feature seems like a boon! Third, like the previous model, this bakeware set also comes with different shaped pans for an excellent baking experience. Suffice to say, all of them will remain unaffected inside the oven when heated at 450° Fahrenheit. Silicon grips are just another center of attraction here. So, if you’re in search of style with ease in a bakeware set, your hunt should end here! 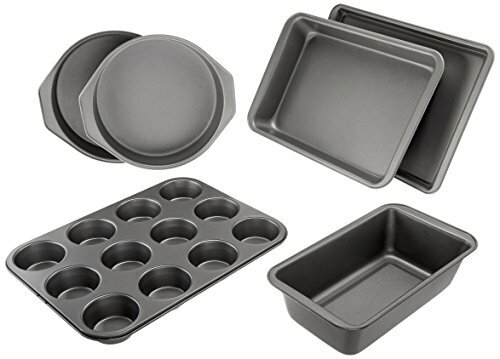 Apparently, this 12 Piece Bakeware Set is a mid range unit for the time, but giving a closer look at it, you’ll find its features incredibly premium. Starting from the shape – these “all around square pans” provide a lot of room on the countertop for better access while cooking. And we find their asymmetrical pattern ideal for carrying a full meal (soup, appetizer, salad, fish, main course and dessert) all together for every single member of your family. This meticulously crafted nonsticky set is comparatively lightweight, and since Copper Chef cares for their users’ health, no harmful chemicals are used in its construction. And cheers to its Cerami-Tech coating, that lets you do baking, slow cooking, deep frying, steaming and roasting, without worrying about the subsequent stubborn spots on pans. To cap it all off, this kitchen workhorse comes at a very affordable price tag. And did we mention it works on both stovetop, oven, tabletop and 1,300 W induction cooktop as well? Why we like it: An all-inclusive and versatile award-winning set to complete your culinary collection. Want the most enduring bakeware set to complement your kitchenware? The ChefLand 10-Piece Nonstick Bakeware Set is it. These appliances are built out of top class carbon steel, keeping the toughest use (as well as cleaning) in mind. To be more specific, they include PTFE material that does not chip off even if you handle in an unforgiving manner. And in spite of their solid framework, they feel very lightweight. On to the looks – that eye-catching dark black color not only makes it an ease on eyes but works on upgrading its standard. This trait is equally responsible for quickening the baking speed as well. The set comes with a full round of culinary kits – starting from the loaf and crisper pans to round pizza and cake pans to cupcake tray. Also, you’ll find a small cookie sheet, a square pan along with the large sized cookie sheet and roasting pan. Turns out, the set contains more than enough to accelerate the confidence of a newbie or wannabe cuisine artist. Users also rave about how this ChefLand product let them multitask in the kitchen. It alone can help you cook, bake, fry, roast, sauté, steam, poach, stir-fry and so on! People are also commenting on its effective heavy gauge carbon steel nonstick coating that literally cuts off the expenditure of cooking spray, saving your food from sticking. The same feature comes handy in keeping the kits corrosion free. For Ever! AmazonBasics is known for their wide range of home and kitchen accessories that are 100% centered towards the dedicated chefs and uncompromising food lovers. That being said, their Bakeware Set is a pretty darn good quality appliance. True, these specific pans are nothing fancy in terms of technology, but their features and service are sure to keep you spellbound. Because the manufacturers did their homework when they designed these 6-Piece, creating them out of stout carbon steel. Consequently, the pans are going to bake your cookies, bread, cakes, biscuits, pizza or whatever in question well by dispersing heat evenly underneath them. Another reason why this model outsells its competition is – its availability on a reasonable budget. However, a few users warned against heating the included baking sheet in the oven, which is sound advice no matter how high or low temperature the display is indicating. With that limitation of the flimsiness understood, this Bakeware Set’s spec sheet is otherwise ideal. The Corningware French White model grew on us as time went on. It comes with an extensive variation in sizes that offers the highest amount of versatility in terms of baking, cooking, and decorating your dine. Its various sized containers are famous not only for replacing a whole bunch of existing utensils but also for giving a stylish, game changing appearance to your countertop. Its glass lids enhance the modern aesthetic and assure top class comfort during your traveling with homemade food. Next up, this freezer safe item grants reliable storage of leftovers without playing the nasty food odor exchanging game! In fact, you’ll find each and every spec of these oven, microwave, and dishwasher safe, classic fluted stoneware dishes intriguingly satisfying. The only complaint that a few purchasers conjure up is that a broken piece arrived with their bakeware set. So, we recommend checking your package immediately after it reaches your doorstep so that you can promptly take an effective step of returning it or asking for a refund. However, since you’re aware of this prechecking tip, we don’t think such apprehension of receiving defected products should be any deal breaking issue for you. With all the traits of a top contender, and scoring well in evenly heat distribution, portability, and non-stickiness, the Copper Chef Bake & Crisp Pan Set is a dream come true, especially since the price tag reads less than 40 bucks. In spite of being cheaper than the competitive Corningware French White, the Copper Chef features PTFE and PFOA free Cerami-Tech coating which makes these ‘all around square pans’ functional at multiple levels. Another stand-out perk of having this bakeware set is the ability to get perfectly divided servings for 9 to 18 guests, kudos to its adaptable slicing separators! Besides, the included easy to lift tray will save your time by eliminating any type of clinging issue. On the subject of versatility, its avant-garde heat distribution panels play a subtle role by transforming it into a baker, a deep-fryer, a slow cooker, a steamer, a sauté pan, a roaster and what not! Oh, and pro tip – during outdoor cooking with this bakeware set, a 1,300W induction cooktop by the Copper Chef can be a lifesaver. Highlights? The auto-shutoff function, 5 different temperature presets, and a timer. 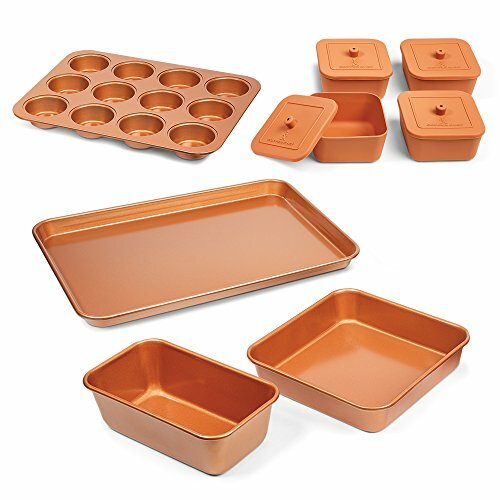 If any bakeware set can have a legacy, the Anchor Hocking Oven Basics is it. It ranked high in durability due to its capability to withstand 425 degrees Fahrenheit in the oven. Thankfully, this feature works without any side effect like browning ingredients no matter how high heat you apply within the range. To confirm optimum service for years, it’s crucial to maintain intervals between temperature changes, though! 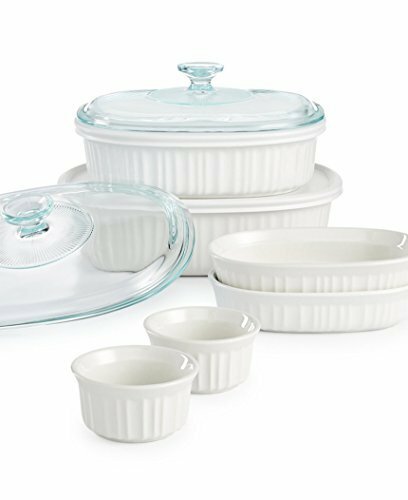 Primarily meant for different sorts of baking needs, this microwave safe kit along with its BPA-free lids can help you reheat the meal. In other words, getting warm food readily, even when you’re too hurry to cook right away, shouldn’t be a serious concern anymore. Plus, it comes handy for storing foods on freezer without absorbing odors or stains. To top it all off, different applications are welcome with its casserole, pie, mixing bowl, and 8 ounce measuring cup – all of which comes as a single set. Finally, with the included custard cups, it’s a deal that is truly hard to beat. Silicone is an amazing substance with numerous applications, from healthcare to electronics. Its unique composition makes it ideal for use in baking and cooking. It is strong, resilient, and able to withstand extremes in temperature. As a flexible material, silicone baking mats are incredibly easy to use and store. They have a natural nonstick property that eliminates the need for expensive parchment paper and unhealthy cooking sprays and grease, and also makes them a breeze to clean. When properly cared for, they can be used thousands of time before replacement is needed. There are vast benefits to using silicone in cookware and this has led to dozens of brands popping up. Some are good quality, but none offered the all round standards of excellence that we were looking to provide. We believe our cooking gift sets achieve a higher standard than other brands. For instance, all of our silicone baking mats are manufactured at a thickness of 1mm. No other brand, not even Silpat baking mats, can boast such a claim to date. We didn’t stop at quality alone, though. We wanted our bakeware sets to really bring the wow factor. 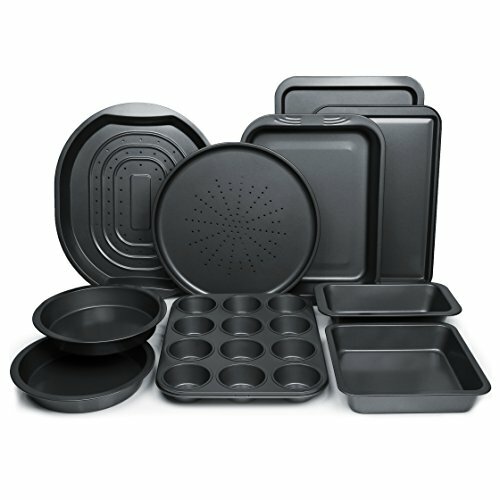 The solid construction of our silicone bakeware sets gives them a sense of luxury in their own right. But, in order to make them truly the best cooking gifts, we had to create a total package. That’s why we made sure that every mat, oven liner and cooking mesh in the set has a sleek, simple, sophisticated appearance that looks amazing in any kitchen. Packaged in a large, glossy envelope, the Best Cooking Gifts line of silicone bakeware sets offers that special extra something you look for in a luxury gift, while the quality materials and construction make them the perfect solution for the practically-minded.